Note: If you really want to treat yourself, put a warm cupcake in a bowl and pipe some of this maple buttercream over it and let in melt into the cake. It is absolutely divine. 2. Beat butter and sugar until light and fluffy. 3. On low speed, add eggs and egg whites one at a time until each in fully incorporated. 4. In a separate bowl, sift flour, baking soda, baking powder, salt, cinnamon and nutmeg together. 5. Add dry ingredients to the butter mixture in thirds, alternating with the wet (milk, vanilla extract and sour cream). Let each ingredient fully mix in before adding another, still be careful not to over mix. 6. Fold in blueberries. Fill cupcake liners ¾ full and bake for about 18 minutes, or until an inserted knife comes out clean. Maple Buttercream: Beat butter and cream cheese until light and fluffy. Add maple flavoring and powdered sugar and let beat again. If needed, add 1 tablespoon of milk to loosen. 7. 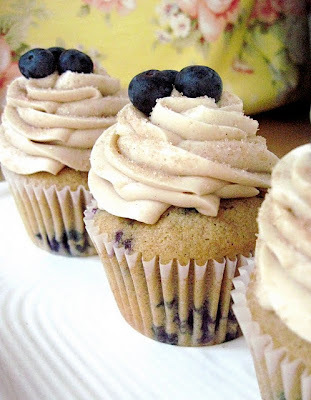 Pipe buttercream onto cooled cupcakes and top with cinnamon sugar and berries.